Castle Pendennis is one of the counters that Henry VIII built within the territory of the British Kingdom. This palace today offers a particularly exciting and spectacular collection of royal accessories, paintings and battle gear. Pendennis is located in the English area of Cornwall. Raised in the years between 1540 and 1545, the main body of its construction was to defend the entrance to the River Fal from its western side. At the end, Henry VIII in 1530 was under threat of war with France and Spain because he decided to part with his Catholic wife - Catherine of Aragon. As a result, the king had to erect a protective fortresses throughout the south coast of England. At the same time on the east bank of the river, St Mawes Castle was built, a task based on the two forts to guard the Carrick Roads of the Spanish invasion. The castle itself consists of an ordinary large round tower, which was built over the entrance door, locked between the surrounding firewall. The construction of Pendennis was separated by less money and effort then the east castle which had invested in it more effort and aesthetics. Although built for battle the fortress was ornamented with decorative stone carvings. Over the centuries Pendennis has played a key role in many battles. It holds a strategic location - high on a hill overlooking the city and its surroundings has a huge advantage in defensive techniques and tactics of the British. It is this fact that is could withstand long attacks against the parliamentary forces in 1646. The more precise fortress on the east bank of the River Fal was in a weaker strategic position - actually it had no protection against ground attacks so the governor of St. Mawes immediately forwarded the parliamentary forces. Both forts were part of the coastal defense system of the United Kingdom during the two world wars. 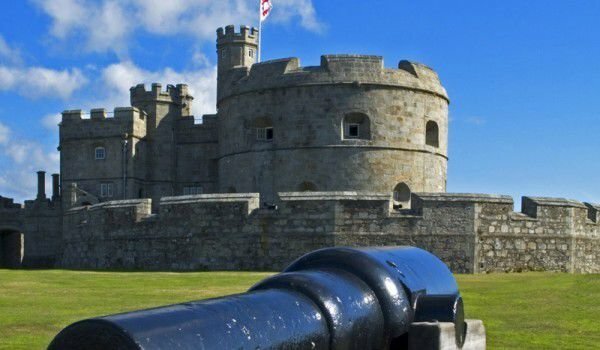 Today the fortress Pendennis is an open center that allows visitors to trace the fascinating history of the castle. For this purpose audio-visual displays have been constructed showing the reconstruction of the battle scenes.